Knitting . . . with a little life thrown in. I found this vest in a pile of clothes a friend gave to me when Biz was born. It looked familiar. Where did I recognize this top from? Think, Trixie, think . . . then it hit me. I knit that damn thing! At first I was a little irked that a gift was "re-gifted" back to me. 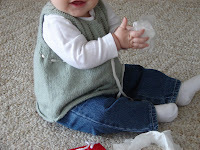 But then it occurred to me that because this was one of my first knits, no photos were ever taken. All I had to document this fun garment was a notebook page with the details. So, let's begin, shall we. We are all aware that I lean (understatement) toward Debbie Bliss patterns. I am not sure if it is the pattern itself or the styling/photos in the books that reel me in. either way, I have knit a few here, and here, and here, and . . . you get the picture. This pattern is titled Eyelet Vest and is on page 8 of Special Knits by Debbie Bliss. I knit this in record time, only five days from start to finish. That includes shopping for ribbon and buttons. Can I mention, extremely off topic by the way, that it is almost 60 degrees outside! The sun is shinning, the birds are singing and I can hear the hum of a boat motor on the lake. Biz is napping on a blanket next to the slider, which is open slightly to let in a fresh breeze. If I take a deep breath, I can almost smell summer. Back to the matter at hand. 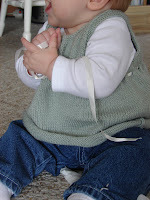 I used Plymouth Yarns Dreambaby DK in a soft green. It knit well, from what I can remember. 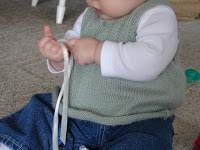 The yarn also seems to have stood the test of time and baby wear, as there is no pilling and any stains wash right out. Feeling smooth and soft is also another positive for this yarn. I ask myself why I haven't knit with this yarn again. There is no excuse, except maybe that I like natural fibers better than microfiber. Only taking two balls of yarn was very easy on the pocket book! Back in 2006 I wasn't as worried about these things as I am now. A word about the notions on this vest. The pattern calls for a small button at the back of the neck (thank heavens, because Biz's big noggin definitely would not fit through without it). I chose a small shell button with browns and greens. It compliments that piece nicely. After several attempts to photograph the button I gave up. Biz was not cooperative at all. The ribbon is run-of-the-mill ribbon from the local craft shop in an ivory color. I do not know the brand. Blocking the vest after each wash is a must. Notice the fabric roll at the bottom. No matter what I do, at the end of the day it is rolling. So this was my trip down knitting memory lane. It is very nice to see where I started my knitting era and how I have changed since then. Re-gifting back to me in this case was good. Note to self: I think I'll hold on to this vest for when Biz has a baby. Then it's not re-gifting . . . it's passing along heirlooms! Hi! Hope you are well and happy! Thanks for popping over to say hello. Looking at your knitting makes me want to knit something - but you know what I'm like... the chances are slim!! Take care. RM would tell you, it's all about me. In reality, it's all about happiness, yarn and getting a great deal on a cute pair of shoes. 2006-2009 All content Copywright by Trixiestix. All rights reserved.